TRISTELLATEIA Thouars, Gen. Nova Madag. 14. 1806.—Type: T. madagascariensis Poir. Zymum Juss., Ann. Mus. Natl. Hist. Nat. 18: 482. 1811.—Type: Z. madagascariensis (Poir.) Spreng. [T. madagascariensis Poir.]. Platynema Wight & Arnott, Edinburgh New Philos. J. 15: 179. 1833.—Type: P. laurifolium Wight & Arnott [T. australasiae A. Rich.]. Woody vines, sometimes shrubby with twining branches; vegetative hairs medifixed; stipules borne on base of petiole; leaves mostly opposite, sometimes subopposite or in verticils of 3 or 4, bearing 2 (–4) glands on abaxial surface at base or on margin, or biglandular on petiole. Inflorescences terminal or lateral, single or grouped in panicles; pedicels pedunculate; floriferous bracts and bracteoles eglandular, persistent. Sepals leaving outermost petals exposed in enlarging bud, all eglandular (mostly) or less commonly bearing 1–10 tiny round rudimentary glands at the base of 1 or more sepals; corolla almost radial but rotated slightly so that 2 posterior petals are uppermost; petals glabrous or thinly sericeous on abaxial keel, the limb entire or denticulate; androecium radially symmetrical; stamens glabrous, the filaments somewhat to much longer and wider opposite petals than opposite sepals, distinct or connate only at very base; anthers poricidal with oblique internal or lateral subapical pores; pollen with 4 pores per grain disposed tetrahedrally, without ectoapertures; gynoecium bilaterally symmetrical, the carpels 3; style usually 1 (sometimes with a second, usually shorter, style developed), long and slender, often incurved, with the very small stigma apical or slightly internal. Fruit dry, breaking apart into 3 samaras separating from a pyramidal torus; samara with a dorsal winglet or crest (sometimes much reduced or lacking), the lateral wings divided into 4–10 flattened elongated winglets; lateral winglets proximally thickened with spongy aerenchyma. Chromosome number: n = 9 (Raman & Kesavan, 1963, counted in a cultivated specimen of T. australasiae [cited as "T. australis"]). There is one species of Tristellateia in eastern Africa (T. africana S. Moore) and another widespread in southeastern Asia (T. australasiae A. Rich.). All the other species are endemic to Madagascar, where Tristellateia is the most commonly encountered representative of the Malpighiaceae. Arènes (1950) recognized 19 species in Madagascar. [maps] — Regional keys to genera: Kenya & Tanzania, Madagascar. 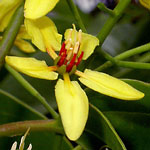 Among Old World genera of Malpighiaceae, Tristellateia is easy to recognize because of its poricidal anthers and samaras with the lateral wings divided into 4–10 lobes. The only other palaeotropical genus with poricidal anthers is Acridocarpus, which differs from Tristellateia in these characters: its leaves are usually alternate (but opposite or subopposite in some species), it lacks stipules, there is no peduncle between the bract and bracteoles (i.e., the pedicel is sessile), the petals are coarsely dentate, the two similar styles are subulate with minute stigmas, and the samara bears a dominant dorsal wing and has no lateral wings. No other palaeotropical genus has samaras at all like those of Tristellateia. The neotropical genus Tetrapterys bears samaras that resemble those of some species of Tristellateia, but the two genera are not closely related and surely evolved their fruits independently [family phylogenetic tree]. Tristellateia is especially interesting because it represents one of nine lineages that migrated independently from the New World to the Old World (C. C. Davis and W. R. Anderson, unpublished data). Given the diversity of fruits in the Bunchosia clade, it is difficult to postulate the ancestral fruit morphology in the clade, but it is probably safe to assume that the ancestor of Tristellateia was effectively dispersed by wind. On the other hand, we have at this time no basis for saying what route was taken by that ancestor from the New World to the Old—the presence of the genus in Africa, Madagascar, and Asia, and the lack of any Old World relative, make it impossible to say whether the ancestor travelled east across the Atlantic, west across the Pacific, or by some more circuitous route. References: In addition to his monograph of Tristellateia (1947), Arènes (1950) provided a treatment of the Malagasy species. That is very difficult to use, especially if the specimen in hand lacks fruits. The genus is extremely diverse in Madagascar, and Arènes was fond of recognizing segregates in such groups. Tristellateia in Madagascar deserves a modern revision. Etymology: The name Tristellateia comes from the Latin words for three (tres) and star (stella), and refers to the fact that the three samaras in the intact fruit resemble a cluster of three stars. Uses: Tristellateia australasiae is widely cultivated as an ornamental, especially in southeastern Asia.